After my father left we moved again, this time to a small rental home not too far from our old neighborhood. I didn’t have any interest in another round of fights just to make a new batch of friends, so I stayed inside for the most part and played with a super ball in the empty kitchen. My mother got a job – her first – as a cashier at a grocery store. She’d come home every afternoon and lie down on her bed and cry. My sisters completely drop out of my memory during this period. I assume that they found something to keep their minds occupied. We started going to church so that we could pray for my father’s return. I knew my mother believed in God, but religion hadn’t factored too heavily into my life up to that point. The preacher was nice enough, but he was monotonous. If I’d known what a didgeridoo was at that age, that’s how I would have heard his sermons. He was one of the adults in the Charlie Brown universe, only not as engaging. Besides, I was up to speed on the basics – God lived in the clouds and Satan lived down below. My interpretation of this was that I could never let my feet get near the foot of the bed, else the Dark Lord would grab my piggies and drag me into the abyss. Aside from that bit of personal dogma, my pre-church going brush with religion was limited to staring at the paintings in my Children’s Bible. Here’s what I took from those paintings: 1) God is a sunbeam who pokes through the clouds; 2) Jesus is a hippy; 3) Nobody likes hippies until they’re dead. And so my social circle was a crying mother, a boring preacher, a bouncy ball, and a macabre picture of a half naked hippy peacefully nailed to a board. The first day of the new school year arrived, and by some fortunate twist I landed in the same fourth grade class as my best buddy Curt. He of the Evel Knievel and the Hot Wheels and the dog named for a John Denver song. This was quite a windfall. I’d have a Robin for my recess game of Batman, a lunch buddy to borrow a spork from should I break mine on my mock chicken leg. Curt was a truly decent person. He was easily the best baseball player in my age group, yet he always insisted that he wasn’t as good as me. He could ride his bike with no hands and build a model of Big Daddy Don Garlit’s dragster without getting gluey fingerprints all over it. All those talents, and you could still depend on him to share his pudding cup. As soon as we saw each other we ran to the back of the classroom and picked out seats side by side. We knew it was temporary, as the teacher would arrive any moment and move us to our assigned seats, but for a few minutes we could pretend that we were the bad seeds, the Sweathogs loafing in the back row. “Yeah, that’s better,” he said. “If I get to call you by your first name, why shouldn’t you call me by my first name? I’m Gar, and I’m going to be sharing the next year with you.” David Crosby once said that the Seventies were when the Sixties happened. I think he had Gar Rigoni, fourth grade teacher, in mind. The first few days were the acid test. Kids would get up and walk around, take their new freedom for a test drive. Gar didn’t mind. Kenny, the only kid in the school who collected hockey cards, brought increasingly noisy food to eat, never earning more than a “that looks good!” in return. We were never moved to assigned seats, so Curt and I stayed in the back row, next to the butcher paper. This would be my hill to die on. This is where I chose to take on the man. While Kenny munched his way through another stack of Pringles and half the kids either pretended to sleep or wandered aimlessly, I turned around and wrote “Garfield Goose” on the back wall, underline and all. Garfield Goose was a local morning cartoon show, hosted by some old timer and his goose puppet. Yes, yes. This would surely drive the crazy hippy over the edge. I couldn’t wait for him to drift toward the back of the room. The anticipation was killing me. About eleven and a half days later the recess bell rang, and Gar walked toward my seat. “I can’t wait to see what you wrote!” he said. Suddenly this was very real. I was going to prison, or at the very least would be expelled. I had insulted a teacher. There was no coming back from this. “Garfield Goose,” he said, and then he started laughing. “Right on! You’re a very smart guy! You figured out my real name is Garfield and you made the connection! Right on!” I didn’t want to be Batman or a magician or a baseball player or an anything anymore. I wanted to be Gar. Once the newness of being treated like a little adult wore off, our classroom normalized. Only sleepy kids slept, only hungry kids ate. The only reason any of us stood was to pick up something we dropped. Gar was electric. He was what the preacher should’ve been: full of love and enthusiasm and encouragement. Never mind times tables, let me show you what algebra is. What’s this story? Let’s read a novel instead. He was the Pied Piper, and we would’ve followed him anywhere. One morning after we’d finished our math, Gar told us that we were going to have a schedule change. Once a week at this time Mrs. Hemmings, the music teacher was going to come to our classroom. Right on schedule, a 287 year old woman shuffled through the door. Her back sported a mighty hump. She wore a sensible wool dress, a string of pearls, and old lady shoes. Red lipstick was drawn where her lips used to be. “Helloooooo, children,” she said. She continued her epic shuffle toward Gar’s desk. “Helloooooo, children,” she repeated. “Good morning, Mrs. Hemmings,” someone said. “Good morning, Mrs. Hemmings,” we repeated. “Lovely! Mr. Rigoni will leave us now so that you can open your beautiful velveteen ears to the wonderful world of music.” Gar set a record player up on his desk, smiled and waved goodbye. Mrs. Hemmings started the record. It was the kind of music I’d only heard in museums. Strings and things. It was the musical equivalent of the boring preacher. Kenny pulled out a sandwich. Mrs. Hemmings turned off the record. “You will go to the principal’s office right now. You are causing a distraction, and these boys and girls cannot open their velveteen ears to Vivaldi.” After Kenny left we sat quietly and listened to her scratchy record. When Gar returned and Mrs. Hemmings’s velvet ears were well down the hall, we told Gar everything. Later that day the principal came in and asked to see Gar in the hallway. We knew Kenny was doomed. This pattern repeated for weeks, with Mrs. Hemmings growing more and more frustrated with us and the principal visiting Gar more and more often. 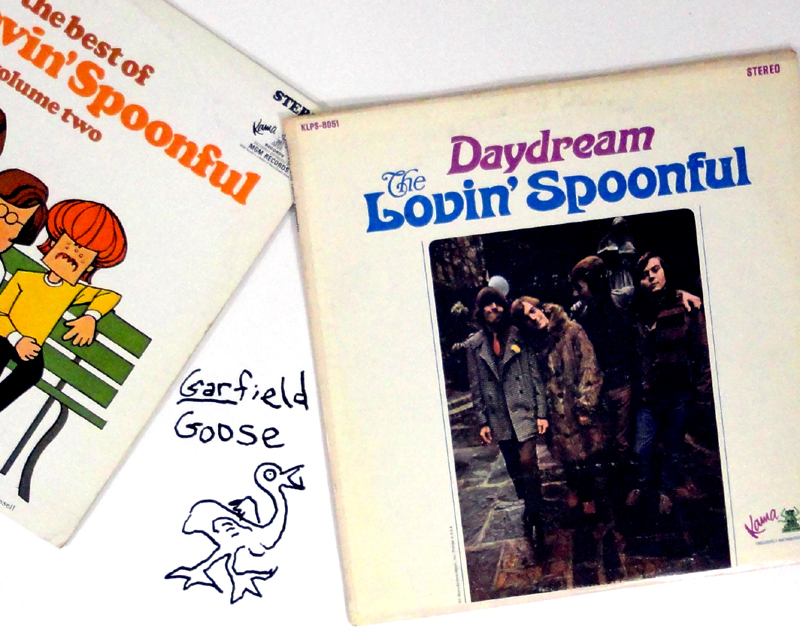 He took a shot at turning the hostile tide Mrs. Hemmings created by bringing in a Lovin’ Spoonful record. After he played it for us he explained that the guy singing was the same guy who wrote and performed the Welcome Back Kotter theme. We were duly impressed, but Mrs. Hemmings was even more annoyed when we told her that Gar had brought in that horrible hippy music that was bound to ruin our beautiful velveteen ears. One afternoon I arrived home from school and found my mother smiling rather than crying. “Your father wants us back,” she said. “We’re moving to Texas.” He had been gone almost a year. I was excited to be moving again and I was happy that my family would be back together, but I knew I was losing something special. Sure enough, my small town Texas school teacher was a beehive and cat’s eyes kind of gal who didn’t cotton to any shenanigans. Many years later I tracked down my childhood pal Curt. After we caught up on our own lives, I asked him whatever happened to Gar. I have told this story three times now: Once to a therapist; once to my daughter; and now to you. Each time I have bawled my eyes out. My adult logic fully understands that there is nothing that I could do, but inside me is a little boy who truly believes that if he would’ve just told Gar once how much he mattered then thousands of little guys like me would’ve had the joy of knowing that beautiful man. And every time I hear John Sebastian, that little boy pops his head out. Gar Rigoni was that sunbeam peeking through the clouds. He didn’t deserve to be nailed to a board. When I started reading, I was feeling for the loneliness of that first year, and besides the very funny visuals of the preacher and not sleeping with your feet over the bed (was that just the norm for the semi traumatized ten-year-old’s basic rule on how to avoid falling accidentally into Hell? I STILL do not let my feet hang over the bed), I got quite a jolt when I read that you had a memory drop. I have huge gaps in my memory, especially that summer of divorce. Reading this made me feel not so alone, as I have been so mesmerized by your crystal clear memory, and ability to visually paint the picture for the rest of us – you have a blank spot! So, once again you have done it – set me up with the visual, made me feel at home sharing a memory gap, then taken me on the walk to the first day of fourth grade. You introduced me to a teacher that is someone I never experience in any grade, and then you very gently put me in your shoes when you heard the news. This time reading, it was not picturing you getting such news. You put me in your shoes and walked away, leaving me to picture myself, and I have not stopped crying since. I was watching T.V. the other night, for the first time in weeks, and something sparked the memory of when my parents were still together, we had three cats and a dog. Two of the cats ‘ran away’ it seemed. There was some sort of desultory calling, but they had strayed off, and that was that. A few months later, my mother was taking a break from writing, and for once she came out of her office without looking at me with her mouth thinning, and her eyes going black. She asked me if I wanted to go on a walk with her. Talk about excited! She wanted my company! We went up into “The Fields”, a long hilly undeveloped space by LAX that, if you walked long enough, you reached the beach. We made it to the cliff of the beach, and were watching the waves. We were not holding hands, but I was close to her, I can smell her comfortable tweed pantsuit. She turned to me and smiled, she had such a beautiful smile. Her smile stayed put, and I have no idea what my face must have looked like, but it must have made her happy, because she hummed the whole way home. I thought I wanted to fill in the memory gaps. Now, not so sure. That may be one of the most disturbing anecdotes I’ve ever heard. When I try to tell anyone that my mother is a sociopath, they figure it is just mother/daughter angst. I guess it makes more sense why my trips downtown were not just for fun. I’m no expert, but I think that while painful filling in the gaps is far healthier than a trip downtown. It’s like removing an inflamed appendix versus covering it up with painkillers. Every time you share one of those anecdotes it loses some of its darkness and power. Go ahead and say “Voldemort” a few dozen more times. It’s less spooky with each repetition. I used to have dreams of monsters chasing me, and before bedtime, I would, I guess hypnotize myself into telling myself to stop running in my dream and turn around. Night after night, it never worked, I just wet the bed. Again, what you have started here has helped me, and others who have commented on my blog, to fill in the gaps, or at least sit with them, and talk about it. To me, silence is the biggest killer of all. Been thinking about how to exactly put down in words how reading this piece made me feel and I still haven’t been able to articulate it quite right, but I’ll give it a try. I grew up in an extremely religious home with images of Jesus hammered into us by bible stories, fire and brimstone sermons and of course the images in our children’s bible. Where you describe what Jesus looked like to you, I had to smile and laugh thinking about my own imaginings of the “savior” at the same age. To me he looked like the “hippy” people my Mother and Father warned me to stay away from, the ones that did drugs, didn’t have a job or money and would end up homeless or worse as liberal atheist. As I read about Gar, I kept smiling to myself and remembering the few teachers that speckled my own school career, the ones that challenged and inspired me to imagine a world beyond the one I existed in, though none of them were quite as special as Gar sounded. As I reached the ending I literally gasped out loud as you revealed the tragic ending of his story. What I took away from this is that it is of vital importance to tell those around us how special they are. It sounds basic and even a bit trite, but I do truly believe it makes a difference. One last thing, the final lines in this post are a beautiful tribute to the teacher, the man, the hippy….the savior, Gar Rigoni. I think I like your comment better than my story. Can we trade places? Ha! Thanks, but I am not nearly as gifted at weaving an intriguing and poignant story as you, my friend.